A-line skirts have flared sides that resemble the legs of a capital "A." They are roomy in the thighs and provide a bit of flirt to your stride while walking. This a-line skirt pattern has an elastic waistband and can easily be stitched by a beginner sewer or experienced seamstress. 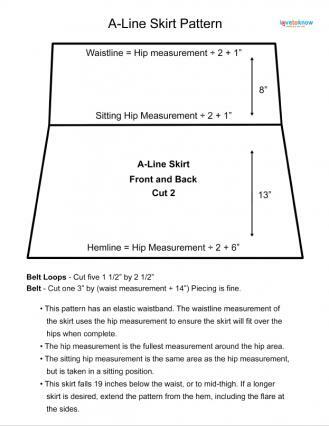 Use your personal body measurements to create an a-line skirt with a custom-fit. 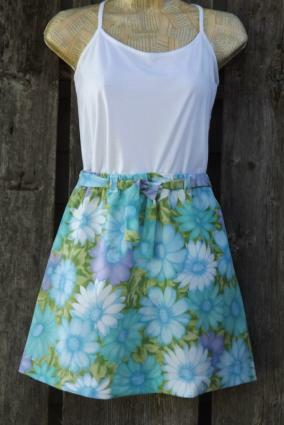 This skirt can be made in less than two hours, allowing you to make and add several to your wardrobe. Click on the diagram below to download and print the pattern diagram instructions for drawing your customized pattern. If you have trouble printing the pattern, try these helpful tips. When printed, use the required measurements to trace the skirt pattern on the back of the wrapping paper and cut out. Using your skirt pattern and the dimensional measurements on the printable for the belt loops and belt, cut two skirt pieces on the bias from waistband to hemline, five belt loops and one belt from your fabric. Place the two skirt pieces together with the right sides facing each other and pin the sides. 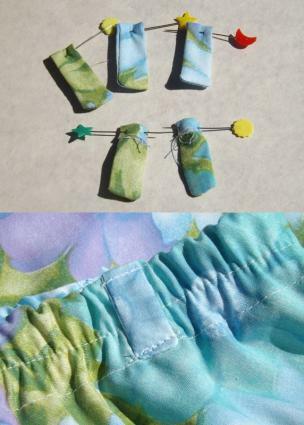 Sew the pinned sides using a 1/2-inch seam allowance. Press the seams open. Fold the waistline 1/4-inch to the wrong side and press. Fold again 1 1/4 inches, press and pin. Sew the pinned fold to create the casing. Leave a 2-inch opening for inserting the elastic. Cut a 1-inch-wide length of fabric 3 inches shorter than your waist measurement. Attach a large safety pin or bodkin to one end of the elastic and thread it through the casing. Overlap the ends by 1/2 inch. Sew over the ends several times for a secure hold. Push the stitched ends of the elastic into the casing and stitch the opening closed. Sew horizontally around the waistband, through the center of the elastic's width. While sewing, pull the elastic until the fabric is flat (no gathers from the elastic). Stitching through the elastic will prevent the elastic from rolling. Stitch through the middle of the elastic. Fold a belt loop rectangle in half with the right sides together and the long edges matching. Sew along one short end and the matching long edges using a scant 1/4-inch seam allowance. Turn the loop right side out. A wooden skewer will help in turning such a small tube. Press the loop. Fold the open end 1/4-inch to one side and press. Repeat with the remaining loop rectangles. Determine which side of the skirt will be the back. Lay the skirt on your work surface with the back facing up. Find the center and place one loop vertically over the elastic waistband. Line up the closed end of the loop along the top edge of the skirt and pin both ends to the waistband. Sewing as close to the pinned ends as possible, secure the loop. Stitch at least twice over the ends to prevent the stitches from coming undone. Attach a loop to the waistband at each side seam and the remaining two loops at the center-front and separated by 5 inches. Fold the belt strip in half with the right sides facing and the long edges matching. Pin the ends and the long matching edges. Sew the pinned edges using a 1/4-inch seam allowance. Leave a 3-inch opening in the center of the long edge. Turn the belt right side out and press. Machine stitch the opening closed. Insert the belt through the belt loops. Fold the bottom of the skirt 1/4-inch to the wrong side and press. Fold again 1 inch, press and pin. Sew the pinned edge to hem. Cutting fabric on the bias will allow your finished garment to stretch and drape nicely over curves. The grain of fabric runs through the length of the fabric as it is cut from the bolt. Against-the-grain is from selvage to selvage. Think of grain and against-the-grain like a "+" sign. Bias runs diagonally. Think of bias like an "X" placed over the "+" sign. The legs of the "X" are the directions of the bias. Mastering a simple a-line skirt will have you hunting for other techniques. Check out these tutorials that include options for a bordered hem, adding a lining and inserting a zipper. One Avian Daemon has a hemless a-line skirt tutorial that's just perfect for the novice sewer. It features an attached border for the hemline and has excellent written and visual instructions on inserting a zipper. Give your a-line skirt a professional looking finish with this skirt-lining tutorial on Sew Spoiled. This tutorial is appropriate for a seamstress with intermediate sewing experience. Now that you know how to sew a basic a-line skirt, customize it even further. Consider adding pockets, trims, ruffles or appliques that are unique to your personality or fashion mood.